Being able to fit design into the Agile software development processes is an important skill in today’s market. There are many ways for a UX team to succeed (and fail) at being Agile. 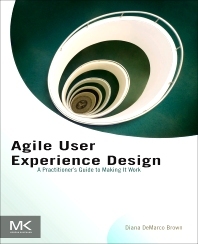 This book provides you with the tools you need to determine what Agile UX means for you. It includes practical examples and case studies, as well as real-life factors to consider while navigating the Agile UX waters. You’ll learn about what contributes to your team’s success, and which factors to consider when determining the best path for getting there. After reading this book, you’ll have the knowledge to improve your software and product development with Agile processes quickly and easily. Should we Even be Agile? How Long Should Sprints Be? What Deliverables Should UX Produce? How Should the UX Team Fit in With the Development Sprints? How do you Get Developers to Talk About the Design of One Thing While They are Busy Implementing Another? What if UX Team Members have to Support more than one Project? How do we Fit User Research into the Sprint Cycle? What if the Team Claims to be Agile, but Agile Values are Nowhere to be Seen? What if the Team is not Colocated? What do i do When Someone Uses “That’s not Agile” As a Reason not to do Something? How Does the UX Team Plan and Research for the Next Release? How do you Manage Internal Stakeholders? Diana Brown has been designing interactions and software interfaces for over a decade. She has spent a good portion of that time talking to end users and finding ways to encourage them to talk to her. Much of the rest of her time has been spent talking to her development teams and finding ways to encourage them to talk to her. She continues to be amazed by all of the cool things that software can do. has been designing interactions and software interfaces for over a decade.